Problem Description The disease appears in patches at the seedling and adult plant stage. The disease appears in patches at the seedling and adult plant stage. 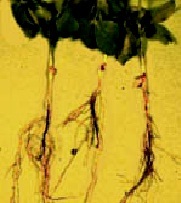 Seedling wilt is characterized by sudden drooping and drying of leaves leading to death of plants. The roots look light brown and show reduced proliferation. Symptoms at adult plant stage appear from flowering to late pod – filling stage. Top leaflets show sudden drooping, premature shedding followed by wilting of the whole plant or individual branches. No internal discoloration of the vascular system is visible. The adult plant wilt appears at flowering and podding resulting in shriveled seeds.